My favorite thing to do with a bunch of amaranth leaves is to make Jamaican Callaloo. Callaloo seems to be one of those words that is used to mean the soup, the cooked vegetable, and the growing vegetable, at least in Jamaica. 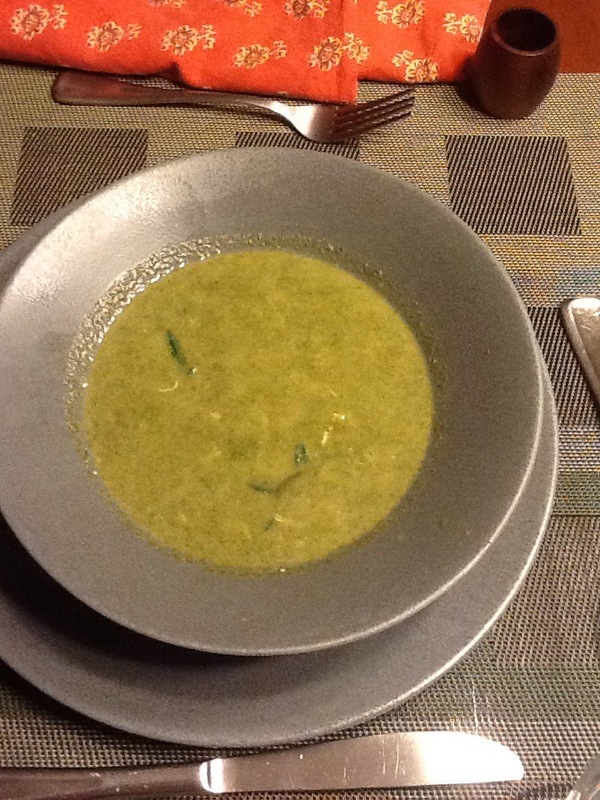 Callaloo soup in Trinidad seems to be made with a different plant. I use a a variation of this recipe. Amaranth grows very well in Florida. Once you have it in the garden, you will never get rid of it and it is a green that will survive the heat and humidity of a Florida summer, so I am not surprised to find it in Frog Song’s CSA box this week. Here is the recipe that makes enough for four. Thyme, okra, chopped amaranth stems, coconut milk, chicken broth, crab meat, scotch bonnet pepper, amaranth leaves, onion and garlic. Ready for callaloo. One large bunch of amaranth leaves. One clove of garlic, sliced. Four cups of chicken broth. I like to make my own, but we didn’t have any in the house today. One cup of coconut milk (I have seen various callaloo recipes with this, but having made the soup with it, I don’t think it adds much to this recipe. Wash the callaloo thoroughly. It can be one of those gritty greens. Separate the leaves from the stems and chop the stems roughly. 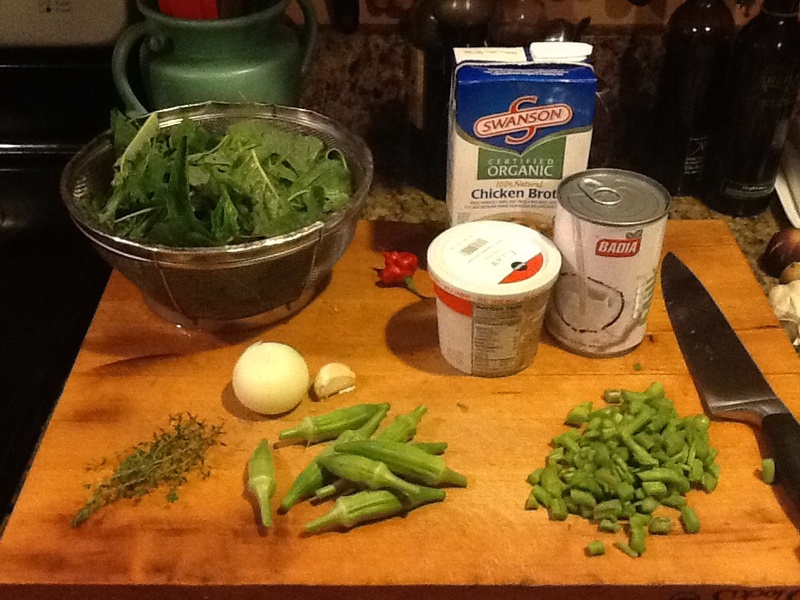 Add all the ingredients, except the crab and the okra, to a soup pot and simmer down until cooked through. Perhaps 20 minutes. Remove the scotch bonnet pepper and be very careful to keep it whole. This way it adds great flavor but not intense heat to the soup. If you purée the pepper, watch out! It will be very hot. Strain the solids and place in a food processor and purée. If you prefer a non-puréed texture, strain the solids from the liquid and chop finely. Return to the liquid. Add the crab meat and the chopped okra. Add salt and pepper to taste and heat through. I served it with lovely Olde Hearth whole wheat levain bread. So the verdict? Bethany likes it, but would prefer better crab. Sam is not so keen. Deborah is too polite to say. I agree, a can of crab from Publix is not a great ingredient, but this is why I titled this post the fish issue. Getting good seafood is a big problem in Central Florida. Wholefoods has some good choices, but they are very expensive. Lombardi’s isn’t great. Publix’s is slightly cheaper, but the quality is not great and you are buying into the global seafood industry (my crab came from the Philippines) with all the problems that come with it; unsustainability, poor labor conditions, and environmental damage. See this interview with Paul Greenberg on NPR’s Fresh Air for more on this issue. My callaloo would have been great with fresh crab caught from the end of the pier by the kids on a family vacation. But is that the only way to have seafood in my diet? That doesn’t strike me as globally sustainable either. We will return to this issue when I write about our second course. Can you get fresh crab in New Smyrna? I don’t do fish anymore since we have several fish allergic kids in our family. We used to get really good crab in FL. Roz, I a not sure about crab in new Smyrna. If you know a good source of fish over there, let me know. We visit often.